The star-studded English language opera that enchanted San Francisco around this time last year, Dream of the Red Chamber, kicked off its Chinese mainland premiere in Beijing on Friday, returning to the city where the story was first written and published. Based on the 18th century epic of the same name written by Qing Dynasty (1644-1911) writer Cao Xueqin, the two-act opera was supported by the Minnesota-based Chinese Heritage Foundation and created by a group of prominent Chinese and Chinese-American artists, including MacArthur Fellow Bright Sheng as composer, Tony Award winner David Henry Hwang as co-librettist along with Sheng, Stan Lai as director and Oscar winner Tim Yip as costume and stage designer. Dubbed "the hottest ticket in town" by the local San Francisco Chronicle, the opera created quite a buzz when it premiered in the US last year. It held its Asian premiere in Hong Kong in March closing out the 45th Hong Kong Arts Festival. Imported by the Hong Kong-based Armstrong Music & Arts and the Poly Theater to the Chinese mainland, the show will tour to Changsha and Wuhan, the capital cities of Central China's Hunan and Hubei provinces, over the next two weeks following Beijing. Before its official debut on Friday, the San Francisco production opened its Thursday's dress rehearsal at Beijing's Poly Theater to media VIP guests and curious local audiences for a sneak peek into the familiar yet exotic work. Tickets for the next two nights nearly sold out, according to the organizers - another reason why the organizers decided to open the rehearsal to VIP guests as it has been almost impossible to make room for them at the official shows. While waiting for the rehearsal to start Thursday, the audience took pictures and examined the promotional boards at the entrance. "I have no idea at all what it would look like," a 40-something spectator told the Global Times, adding that "a Chinese story in the form of a Western opera created by a Chinese team is worth waiting for." And it was. Starting with the narrative monk (played by Pichead Amornsomboon) explaining the unearthly origin of Baoyu (played by Chinese tenor Shi Yijie) and Daiyu (played by Chinese soprano Wu He) and how the two came to the human world, the story naturally shifts from divine mountains to the magnificent Jia family. While the first act is about the sweet love between Baoyu and Daiyu and the glory of the Jia clan, the second act depicts the decline of the family and the bitter marital tragedy the lovers experience. Along with Sheng's music, which features Chinese folk music rhythms and Peking Opera elements, and Yip's romantic stage design, the show renders exceptional oriental beauty as well as the theme of illusion versus reality that appears repeatedly in the original novel. Though it might be a bit strange to Chinese readers familiar with the classic novel to see the thousand-page story be streamlined into a love story, this move was necessary as a strong central story is needed for a two-hour opera. "I think the opera retains most of the essence of the novel. Now we are just waiting to see what the Redologists [experts studying Dream of the Red Chamber] will say," Lai told the Global Times on Thursday. "I hope they understand that you can't include everything from the book in a two-hour opera," he said. Aside from a few new cast members and local philharmonic orchestra troupes and the Chorus of the State Opera of Dnipro from Ukraine replacing the original band and choir, this version has not made many changes from the San Francisco performance, Lai said. "All the sets and costumes including the wigs were transported from the US," Lai noted. 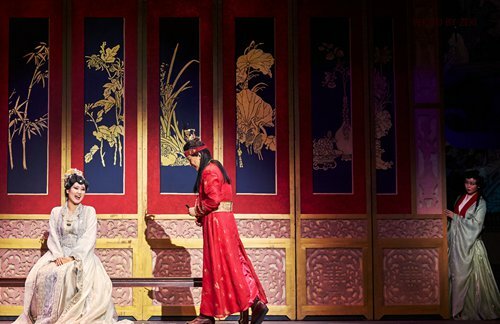 Since Western opera is an unfamiliar art form in China, some audience members told the Global Times that they "had a hard time understanding the opera, but the stage design is pleasing to the eyes." Lai said that this was expected. He told the Global Times that the show could also be viewed "as a chance to introduce opera to China." For professionals, on the other hand, the show is by all means a feast both to the ears and eyes. "Definitely a world-class production," a Chinese music producer, who wished to remain anonymous, told the Global Times. "First-class music, first-class directing and first-class stage design. Sheng's conducting was just superb!" "I support this daring attempt," Ouyang Fenqiang, the Chinese actor who played Baoyu in the classic 1987 Chinese TV series Dream of the Red Chamber, in a reply to the show's official Sina Weibo account in late August. "It will make Dream of the Red Chamber known to the world." After the Friday premiere, Chinese audience and netizens discussed the opera on Chinese social media platforms. "How ironic that an English opera version of Dream of the Red Chamber has rekindled my interest in the original novel!" wrote CCTV-NEWS anchor Zhu Lianan on Sina Weibo account on Saturday. While some saw the opera as an innovation, some expressed their disappointment. "It's probably because this is a Westernized work aimed at a Western audience or that I am not an opera person, I think the portrayal of the characters were rigid," wrote Sina Weibo user Zhang Xiaoxianer.